One side of a well-used coin is the maxim that truth is the first casualty of war. The other side of the coin is that lying is the first weapon of war. According to the ancient Chinese general Sun Tzu, that’s because all warfare is based on deception. He meant that lying – propaganda, camouflage, false flags, disinformation, infowar, cyber war — is a precondition for winning battles at least, if not wars. As the US military learned since Vietnam, lying is no guarantee of winning. The first remarkable thing about the book is that it has been published at all. Malaysia Airlines Flight MH17 was destroyed in the air over eastern Ukraine at 16:20 in the afternoon of July 17, 2014 (09:20 US Eastern Standard Time). All 298 people on board were killed by the decompression of the aircraft; the majority was Dutch, Australian and Malaysian. They were dead by the time they hit the ground. Their bodies have been recovered, identified, repatriated to their kin, grieved over, buried. The Boeing 777 broke up in the air at 10,000 metres, falling over an area on the ground of about 15 square kilometres . Less than half of the aircraft has been recovered. The parts sit in a hangar at the Gilze-Rijen Air Base, an hour south of Amsterdam, partially reconstructed. Every form of technical and forensic analysis available has been performed, recorded, and until now kept from most of the world — but not kept secret. From autopsies, X-rays and CT scans of body parts, metal spectroscopy of warhead shrapnel, radar and radio tapes, photographs, videoclips, interviews with pathologists, police, prosecutors and lawyers, and analysis of what should have been witnessed but was not, not everything is certain. What is certain is that no Russian-fired Buk missile caused the destruction of MH17. According to van der Pijl (right), the evidence that the downing of the aircraft was a Russian crime – indeed, a crime ordered by Russian President Vladimir Putin – is a lie fabricated from the start in Kiev by officials working for President Petro Poroshenko and then-Prime Minister Arseny Yatseniuk. Twenty-fours later, it was proclaimed by the US Government to the world at a United Nations Security Council session on July 18, 2014. What is now sure is that this was a lie. A lie which escalated a small civil war between eastern and western Ukrainian regions and ethnic groups into a worldwide war between the US and its allies against Russia, China and their allies. There have been three points when the threshold was crossed between the lie and the truth. The first was in April 2015 when the two Dutch intelligence agencies, AIVD and MIVD concluded that there had been no transfer of Russian anti-aircraft missiles across the Ukrainian border into eastern Ukraine before MH17 was shot down; and that the anti-aircraft weapons the anti-Kiev forces already had – the Dutch report calls them “separatists” – were unable to strike at the altitude of civilian airliners crossing Ukrainian airspace. 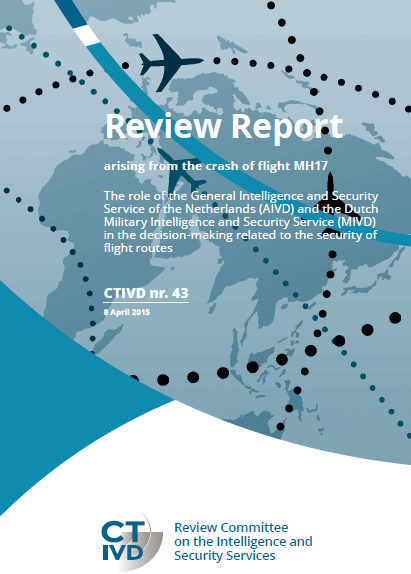 The downing of a Ukrainian military Antonov An-26 on July 14, MIVD said, “was not consistent with a hit by a powerful anti-aircraft system” and “the information received from the MIVD does not point to the use of a powerful air defence system.” Read the Dutch report here. “Prior to the crash,”, the Dutch secret services revealed nine months after the MH17 crash, “ the MIVD knew that, in addition to light [anti-] aircraft artillery, the Separatists also possessed short-range portable air defence systems (man-portable air-defence systems; MANPADS) and that they possibly possessed short-range vehicle-borne air-defence systems. Both types of systems are considered surface-to-air missiles (SAMs). Due to their limited range they do not constitute a danger to civil aviation at cruising altitude” [emphasis added]. “The Russian and the Ukrainian armed forces did have the capacity and potential to hit a civil aircraft at cruising altitude. However, they did not have the intention. There were no indications that they were engaged in activities (such as preparations) targeting civil aviation. There were no indications that the Separatists had the capacity to hit civil air traffic at cruising altitude. Moreover, there were no indications that they would target civil air traffic or that they were engaged in activities with this objective in mind. Prior to the crash, the MIVD and the AIVD did not possess any information that indicated that one or more of the three actors involved in the conflict in Eastern Ukraine displayed a combination of military resources, possibilities or the intention to shoot down a civil aeroplane at cruising altitude. The AIVD and the MIVD did not receive any information from partner services either that explicitly or implicitly pointed to a risk to civil aviation above Eastern Ukraine.” By partner services, the Dutch were pointing at the CIA and NATO military intelligence. The second threshold for the MH17 truth was crossed in March 2017. That month in Canberra the Australian Attorney-General sent a classified memorandum to his Prime Minister saying there was insufficient evidence to conclude that the destruction of the airliner and loss of life had been caused by the act of terrorism alleged by Ukraine, the US and the NATO allies. This meant that according to the provisions of the Supporting Australian Victims of Terrorism Overseas Act and the Australian Victims of Terrorism Overseas Payment (AVTOP), the Australian Government lacked the legal authority to pay out to the families of the Australian passengers on MH17 the $75,000 to which each of them was entitled by the terrorism law. 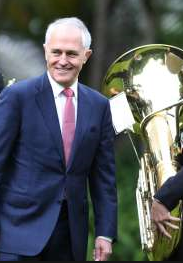 Then-Prime Minister Malcolm Turnbull (right) was asked to explain. He replied through a spokesman: “The criminal investigation of MH17 is ongoing. The outcomes of this investigation could be relevant in determining whether this incident should be declared for the purposes of the Australian Victims of Terrorism Overseas Payment scheme.” The words are italicized to show the Australians knew then they couldn’t substantiate the allegation of a Russian crime which they were proclaiming in public. The third threshold for truth-telling came in September 2018 when the Russian Defence Ministry presented evidence of the serial numbers of two Buk missile parts, exhaust nozzle (venturi) and engine casing, which had been recovered from the crash scene and transported to The Netherlands. The Dutch prosecutors, along with their Australian and Ukrainian counterparts on the Dutch-based Joint Investigation Team (JIT) prosecuting the crime, published these numbers in May 2018, along with an appeal for others to come forward with further evidence of the missile’s origin and its location when fired at MH17. The Russian answer followed four months later. The new evidence is that the weapon had been manufactured at the Dolgoprudny plant, near Moscow, in December 1986; shipped by train to a Soviet military unit at the end of that month; and signed for at its destination in Terebovlya, south of Lvov (Lviv) in the Ternopil region of western Ukraine. The Buk missile remained in the unit’s stock when in 1992 it was renamed the 223rd missile brigade of the Ukrainian Army. In mid-2014 that unit was in action in eastern Ukraine, in the area from which the Dutch aviation safety board and the JIT say the missile was fired at MH17. There has been one other, less well-known threshold. In the only court proceeding to examine what caused the deaths of the MH17 passengers, according to international rules of evidence – a coroner’s court hearing in Melbourne, Australia in December 2015 — a report surfaced by the Australian forensic pathologist who had worked at the mortuary in The Netherlands where the victims’ remains were transported from the crash site. He reported then, and subsequently in court, that the distinctively shaped shrapnel identifying the Buk missile alleged to have been fired was missing from the bodies. In a world where truth can be recognized from falsehood what ought to have happened when each of these thresholds was crossed? It’s this conclusion: the attack which destroyed MH17 originated from a Ukrainian military unit firing a Ukrainian missile. Anything less fails to satisfy the test of beyond reasonable doubt — the standard Anglo-American legal threshold for a criminal prosecution. Even on the civil law standard of balance of probabilities, which courts require for judging causation and compensation, there is no foundation for assigning blame to the Russian state leadership, the military command, or a unit supplying and directing the fighters of Donbass and Lugansk. So why does the entire western world, including a majority of the United Nations Security Council membership; the European Union’s executives bodies, the governments of the NATO alliance states and Australia, plus the mainstream media – why do most of you believe otherwise? Why has the lie prevailed when the truth is clear? The answer is spelled out in van der Pijl’s book, and in the sources he has identified so that readers can check and think for themselves. Of the book’s 198 pages, 62 pages are references; that’s almost a third. Very few are Russian. The most important of van der Pijl’s sources are Ivan Katchanovski, the Canadian academic who has exposed the lies of the Maidan massacre which led to the regime change in Kiev of February 21, 2014; and Max van der Werff, the Dutch author of Kremlintroll.nl, which has exposed the faking of photo, video, audio and witness claims by the Ukrainian secret service and its NATO-financed megaphone, Bellingcat. Left to right: Kees van der Pijl; Ivan Katchanovski; Max van der Werff. Following after them, the universities and think-tanks of the US and Europe, all without exception, have devised false evidence and pseudo-argument to make the case for Russian culpability. The absence of Russian references in the book indicates how thoroughly the Russian intelligentsia and media, including expensive Kremlin-directed outlets like Sputnik, RT and the Valdai Club, have failed to substantiate the truth. The only credible Russian source on the MH17 story for the past four years has been the Russian Defence Ministry and its principal spokesman, Major General Igor Konashenkov. But even they have made mistakes they have failed to acknowledge when they know better. More seriously, they haven’t allowed impromptu questioning at their press briefings, nor in exchanges of emails. Konashenkov’s briefing (with English voiceover) tying the Buk serial numbers to the Ukrainian military finger which fired it has been watched by just fourteen thousand viewers. If the numbers were in millions, would the truth be more powerful than it has proved so far? Van der Pijl’s book explains why not.